So what do we mean by the word "love?" Is this just a human description of a warm and fuzzy feeling? Not at all, insists John. " In this is love," he writes, "not that we loved God but that he loved us and sent his Son to be the sacrifice for our sins." John makes the case that God is the source of love, and that this love is seen most clearly in the death of Jesus on the cross -- a sacrifice designed to bring us forgiveness of sin. 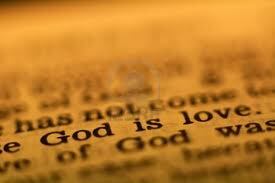 So God is love, at the very core of God's being. God reveals that he is the source of love by sending his only Son to bring us forgiveness and new life. As recipients of such amazing love, there is really only one response we can make: to show love to one another. And this is precisely what John recommends: "Beloved, since God loved us so much, we also ought to love one another." Love is who Christians are. These are challenging words. After all, John is not talking about an emotion here, but an act of the will that can have a transformative effect. "If we love one another," promises John, "God lives in us, and his love is perfected in us." If we take the bold step of loving one another -- God will live in us and bring his love to completion in us. Love is at the core of what it means to be a Christian. Loving one another and believing in Jesus are two sides of the same Christian coin. "Why are you standing looking up to the skies."